John Stith Pemberton was the inventor of Coca Cola, perhaps the best known soft drink in the world today. Pemberton was an American pharmacist, born in 1831 in Knoxville, Georgia. He studied at a local medical school in Georgia, and became a licensed pharmacist in 1850, at the age of nineteen. He married Ann Eliza Clifford Lewis (or Cliff, as she was affectionately called) in 1853 and the couple had one child, a son, born in 1854. Pemberton established a successful wholesale drug business before being drafted into the army during the American Civil War, during which he suffered a painful injury in 1865. In those days, many wounded war veterans used morphine to help dull the pain of their injuries. Pemberton too, became addicted to the use of morphine, but being a chemist, he decided to discover a cure for his addiction himself. The first of these was an opium free painkiller, and then came a formula known as “Pemberton’s French Wine Coca”. This contained extracts from coca leaves (which are used in the production of cocaine), albeit in a very restricted quantity, and certainly not enough to cause the potent effects that cocaine does. The use of coca leaves was later completely removed from the formula. This medicine was advertised as a cure for depression, emotional anxiety and nervous prostration, particularly for women. However, negative public sentiments about alcoholism in those days forced Pemberton to create a non alcoholic version of the drug. He worked with his associate named Willis Venable to help him perfect the formula. A chance occurrence while experimenting with the formula led to the addition of carbonated water, and the resulting taste was so appealing that Pemberton decided to market it as a beverage rather than as medicine. The name Coca-Cola was coined by his business partner and bookkeeper, Frank Mason Robinson. Robinson also hand painted an oil banner with the curved letters saying “Coca Cola” which remains the company’s logo to date. Pemberton took his product to a pharmacy down the street and arranged for it to be sold in soda fountains for five cents a glass. He advertised heavily, using banners, newspaper advertisements and store front awnings. The beverage was delicious and eventually quite successful, but it made a modest start with sales initially averaging nine drinks per day. Pemberton’s son Charles was in charge of production. The first year of sales totaled almost $50, and the business initially made a loss. After being approached by a group of businessmen, Pemberton agreed to sell the beverage for a royalty of five cents per gallon of sales. Eventually both Pemberton and his son Charles divested all their interest in the company due to their pressing need of money. Pemberton died at the age of 57 on August 16, 1888. His body was carried back via train to his hometown of Columbus where a large group of friends, relatives and admirers came to pay their tribute. 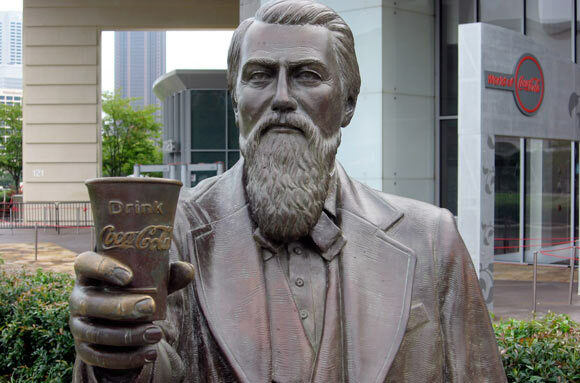 As a mark of respect for his death, not a single drop of Coca Cola was sold in Atlanta that day and all the druggists of the city closed shop to attend his funeral. Both John Pemberton and his son Charles were opium addicts and met their untimely deaths due to the same addiction. He was however, a well respected and beloved citizen of Atlanta and will always be remembered in history for his important contribution towards establishing one of the largest companies in the world today.